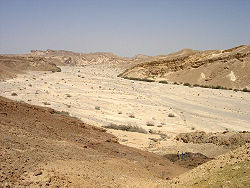 Wadi in Nachal Paran, the Negev, Israel. Wadi (Arabic: وادي‎ wādī) is the Arabic term tradeetionally referrin tae a valley. In some cases, it mey refer tae a dry (ephemeral) riverbed that contains watter anly durin times o hivy rain or simply an intermittent stream.